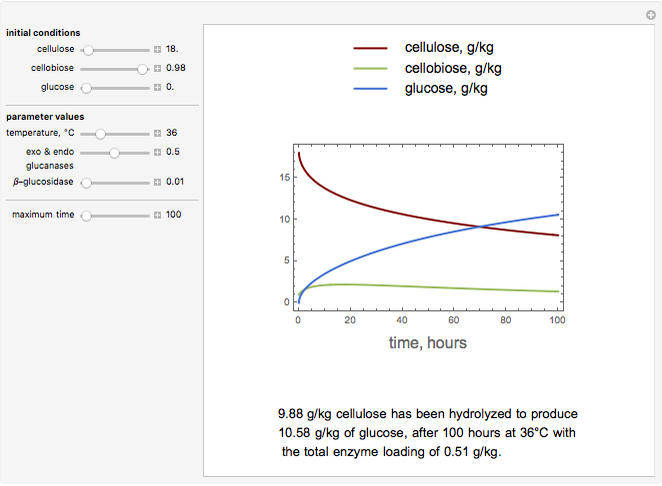 The graphs show the dynamics in cellulose, cellobiose, and glucose mass fraction (as a fraction of the original biomass amount) due to the synergistic action of three enzymes. By varying the temperature and amounts of the enzymes using the sliders for lumped exo and endo glucanases and beta-glucosidase, optimum combination of enzymes needed for any desired hydrolysis over a minimum amount of reaction time can be determined. Like cellobiose, the product of exo and endo glucanases is an inhibitor of both these enzymes as well as beta-glucosidase. Addition of the latter enzyme is needed to hydrolyze the intermediate product cellobiose and increase the overall cellulose hydrolysis rate. 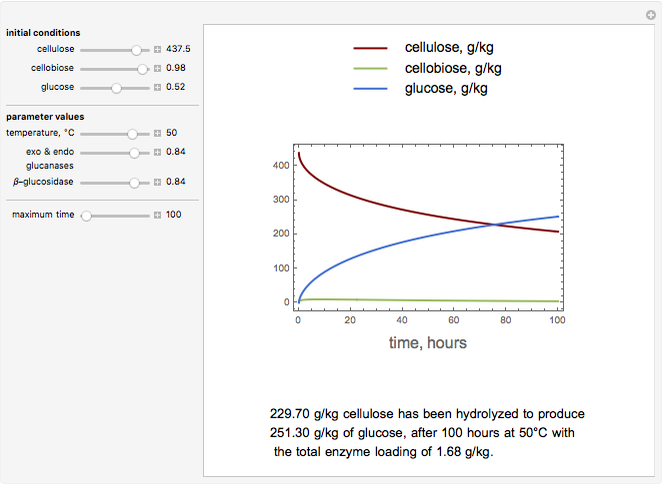 One possible objective of these interactive simulations is to find the minimum total enzyme loading needed to accomplish a desired extent of cellulose hydrolysis from the starting biomass (containing approximately 50% cellulose) within a desired time frame. 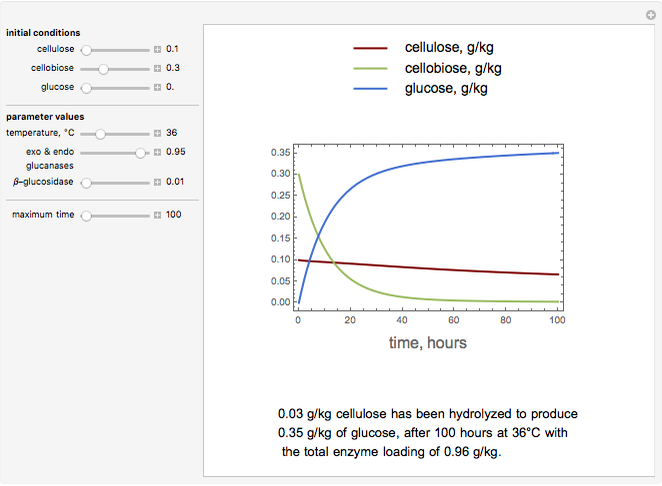 The differential equations used in this Demonstration are taken from the paper by K. L. Kadam, E. C. Rydholm, and J. D. McMillan, "Development and Validation of a Kinetic Model for Enzymatic Saccharification of Lignocellulosic Biomass", Biotechnology Progress, 20, 2004 pp. 698–705. Their model combines the synergistic action of endo and exo glucanases into a single lumped enzyme hydrolyzing cellulosic biomass in two reaction steps. Also, these equations ignore any thermal degradation of these enzymes at higher temperatures and hence are more accurate in predicting hydrolysis at lower temperatures. Dhinakar S. Kompala "Synergistic Enzyme Hydrolysis of Cellulose in Biomass"